One of the guiding principles of the NHS constitution is The NHS is committed to working jointly with other local authority services, other public sector organisations and a wide range of private and voluntary sector organisations to provide and deliver improvements in health and wellbeing. However, re-directing more public NHS services and hence more NHS money to the private sector would inevitably lead to a reduction in services provided by the NHS and ultimately result in the NHS becoming unsustainable. This is the whole premise of the Tory plot to dismantle the NHS. For the NHS to survive and continue to provide quality health services, there has to be a fine balance between how many services/contracts the NHS relinquished to the private sector, and how many it kept. Any of the same services that were provided by both the NHS and the private sector also needed to be tightly controlled with any outsourced services kept to a very minimum. 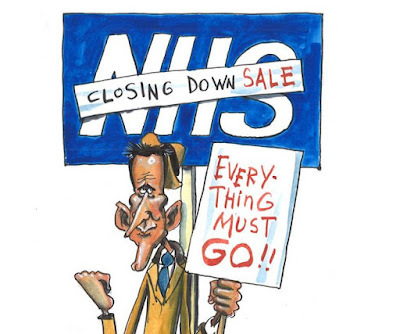 No doubt the private sector has its uses when the NHS became overloaded and patients needed to be treated faster to alleviate pressures in the NHS such as bed-blocking and reducing the elective demand. Until 2012, the amount of NHS services outsourced to the private sector were tightly controlled. To denatioanlise the NHS, all the private sector needed was a sympathetic government that would allow them to take on NHS contracts on a more permanent basis. But if the percentages allocated to the private sector went out of control, money circulating in the NHS would dwindle and again, the result would be a permanent handover of NHS services to private providers on a contractual basis. Knowing this, the Tories began to expand their plot to denationalise (privatise) the NHS. In 2012 the Tory-led coalition government introduced the Health and Social Care (H&SC) Bill making substantial changes to the way the NHS in England was organised. The H&SC bill altered how much work the private sector could undertake. The amount of private work for foundation trust hospitals were allowed to undertake went from 2% to 50% and the market for NHS services was thrown wide open by allowing 'any qualified provider' to take on NHS contractual services. With seemingly little opposition from MPs to the H&SC Bill, and with over a thousand amendments, the H&SC bill became an act of parliament in April 2013. *The bill had a 'risk-register' attached to it but the MPs chose to vetoe it! The Act abolished Primary Care Trusts and replaced them with GP-led Clinical Commissioning Groups (CCGs). These 'Groups' however actually consisted of strategists taking orders from NHS England and doing the day-to-day running of the CCG with GPs having minimal input such as signing off NHS contracts and making decisions on which medicines and treatments it should ration to its patients. The Act admonished responsibility for the Secretary of State for Health to provide healthcare to the Nation of England and passed this on to CCGs. The organisational structure of the NHS had changed vastly under the Act, and the chain of accountability broken leaving no overall responsibility or accountability if the public didn't like any top-down changes made, such as privatisation. Perfect for the Tory plot! The Tory government along with NHS England receive a huge amount of lobbying from private healthcare providers. After ridding their shackles of their coalition partners (the Lib Dems) and being re-elected in 2015, the Tories set about implementing the clauses in the H&SC Act in the name of a document titled the 'Five Year Forward View'. To help with their plot to privatise the NHS, the Conservative government recruited 'Simon Stevens', the ex vice-president of the U.S. private Healthcare company 'UnitedHealth'. In summary, the Tories have now succeeded in getting 'two' successive terms of office: one in 2010 to change how the NHS works (H&SC Act), and the second in 2015 to implement those changes in the H&SC Act (via the 'Five Year Forward View') thus ensuring the NHS is transformed into a private 'healthcare insurance plan' system the same as that in the United States.